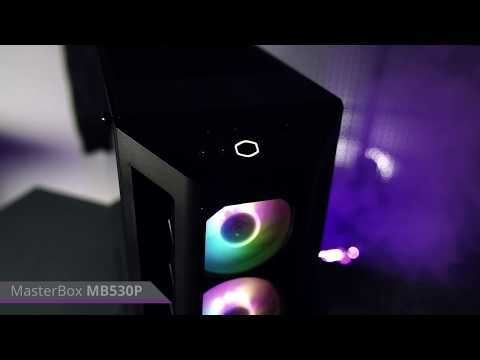 Product Overview The MasterBox MB530P utilizes the aggressive intakes seen on the MB510L, MB511, and MB520, but employs glass on both of the side panels and the front panel. The application of glass was put in place to support the display of addressable RGB fans included with the chassis. Three ARGB fans, an ARGB control button, and a system that is compatible with other popular ARGB components mean each component will be presented through the front and side panels with clarity. 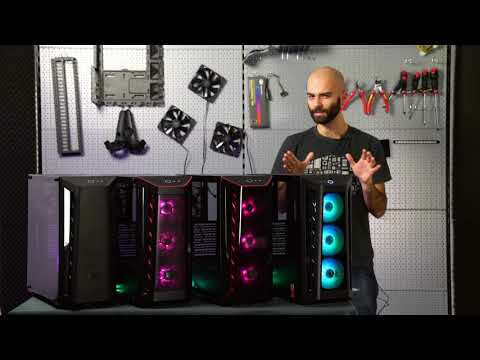 The front and side panel offer a clear view of the front fans and system configuration, while the panel behind the motherboard is patterned tempered glass to hide the open side of the PSU. Sync the lighting on the power button and fans by connecting the ARGB cable from the I/O panel to the included 2 to 3 ARGB splitter. Certified compatible with: ASUS, Gigabyte, MSI, and ASRock motherboards for a comprehensive lighting system. Cycle through lighting colour and mode with the ARGB controller integrated in the I/O panel if your MB does not support lighting control. A PSU shroud, cable cover, and 18~25mm width of space behind the motherboard provides options to keep systems clean; GFX cables can also be routed directly through the PSU shroud rubber grommet. Ample graphics card clearance provides a high potential for upgradeability. Large intakes on each side of the front panel feed air to cool the interior.